Summer In The City is this weekend, and we can't believe how quickly it has arrived (wasn't it only just August 2014??). We The Unicorns will be hanging out at London's ExCeL centre and covering the event all weekend, and we're super-excited to celebrate all the best things about online video, YouTubers, and their fans. The big buzz around SitC this year is that the event has implemented a new ballot system for their meet & greets. The new system means that you should already know in advance whether or not you will meet your faves, and won't have to spend hours in a queue of uncertainty. If you skipped the panels in previous years, you're missing out on a lot! Multiple YouTubers from across the UK (and even some from abroad) will be discussing, bantering, and answering questions on a wide range of topics: from how to start a travel channel, to the importance of gender, race and representation. SitC are now running four panels at a time for the majority of both Saturday and Sunday (and three on Friday's Creator Day); If you missed your fave's meet-up, then look out for any panels they'll be on on the official schedule here. Now that all the panels have their own space, it means that the stage is going to be bursting with non-stop music, comedy, and much more! 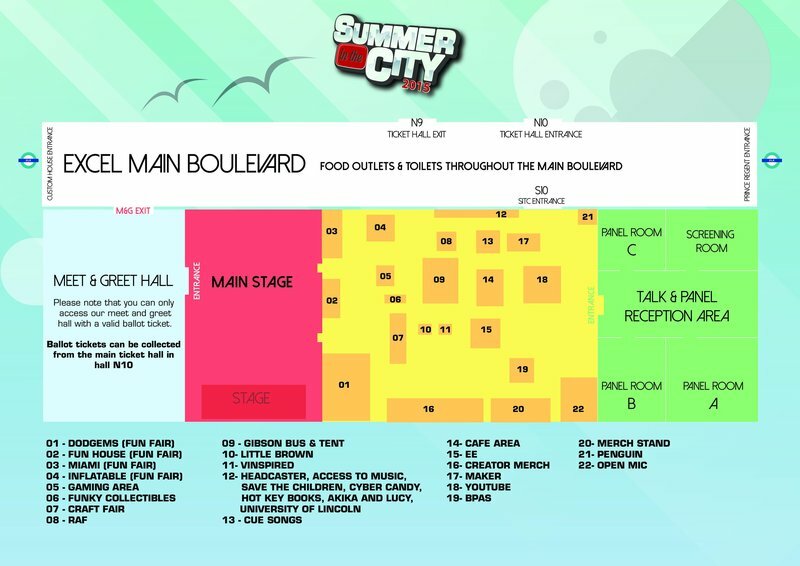 From home-grown YouTube talent like Meghan Tonjes, Bry and Jack & Dean, to pop punk band Room 94, SitC's main stage schedule is packed from noon til night. And who knows - maybe some more of your favourite YouTubers will make some surprise appearances...? Between the panel rooms and the Main Stage lies a stretch of space full of merch tables, sponsor booths, and other things that some attendees might overlook in their excitement to meet YouTubers. What a lot of folks don’t realise is that the Expo Hall is full of fun little extras that the event organisers, sponsors, and even some creators have put together for you. There's going to be an Open Mic stage, a Music Lab and photobooth at the Cue Songs stand, Gibson Guitars' tour bus, and soooo much more. Not to mention that a lot of YouTubers like to hang out in the Expo Hall and meet people; so don't write it off too quickly! 4) Go to the fairground!!! Now that it's found a spacious new home in London's massive ExCeL building, there's a new addition to the event this year - a freakin' fairground. Really! An actual fairground! Does this need any more explanation?? The whole reason SitC was founded was for people to come together and bond over their love of YouTube, and even though it's grown so much, that's still an enormous part of it. Still disappointed that you can't meet your faves? We've got some good-and-bad news - there are probably hundreds of people in the same boat. So find them! Bond over your shared FOMO! Do all the things above together, and leave the event with something even more precious than a YouTuber selfie - an awesome new friend. Here's an amazing place to start: One genius person from the Phandom is arranging an alternative meetup for those who didn't get Dan & Phil tickets. YAS. Whether you're going for just one day or the whole weekend, there is more than enough going on to keep you busy. And as we'll be at Summer In The City to cover the weekend, we hope we'll see you there. Feel free to follow us on our Twitter, Facebook and Instagram to get the latest on the event and find out some more tips and tricks on all the cool stuff that's happening.